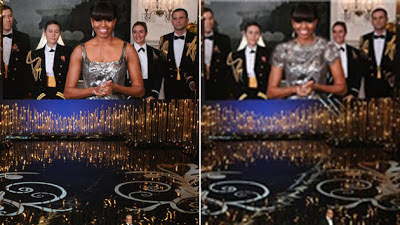 Iran (ABC News)—A semi-official Iranian news agency called Fars altered an image of Michelle Obama at the Academy Awards to appeal to their more conservative readers. 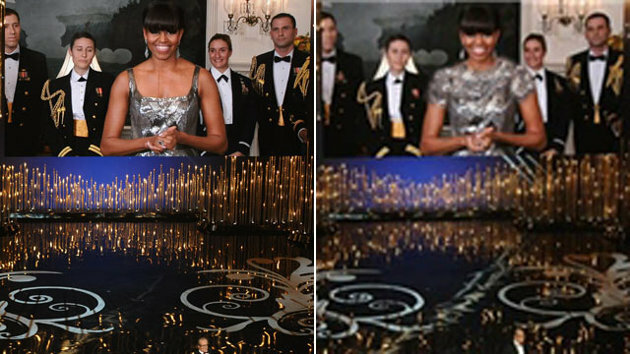 An image was Photoshopped to show Mrs. Obama with covered shoulders and chest-a stark contrast from the sleeveless silver gown that she was wearing by designer Naeem Khan on Sunday night. Although modest by American standards, the designer gown, which exposed the shoulders and partial chest of the first lady, violated the codes of modesty enforced in many Muslim countries. Patrick Ventrell, deputy State Department spokesperson, wouldn't comment on Michelle Obama's manipulated photo but he did say that the State Department has seen images and statements manipulated in the past by the Iranian government. "We've persistently seen Iranian news agencies, whether they're partially or fully state-run, use fabrication and use other means to distort images." I am unsure why an Islamic news organization would even bother with the Academy Awards. For that matter, I am unsure why Christians would either. Instead of falsifying the picture of the First Lady of the United States exposing half of her chest to the entire world, it would have been better to simply state that her photo would not be shown for modesty reasons. I would agree with and support that, as opposed to falsifying the image. @Justin...oh I am sure Iran was watching to see how the movie Argo was going to do. Remember it was about the Iranian Revolution. As long as they were Photo Shopping Michelle, they should have put her in a burqa. Lol why is this a issue.. I agree with the photoshop, she does not need to show all that lets keep stuff covered. Also maybe obumba is one of theres so tbey wanted her to look modest representing iran. The designer of the dress is "Naeem Khan" which sounds like a persian name, I think this is a propaganda tact to boost persian (iranian) moral. Imagine them saying - The First lady is wearing a dress made by one of ours, we are so so talented very soon we'll take over the world. Lols.